At Tridan International, we developed a unique coil expansion machine known as the Flexpander. The Tridan Flexpander comes in the FE and FE-5 models. What a Flexpander does is expands mechanical tubes for heat transfer coils. It is unique designs and machines like these that sets Tridan International apart from other companies. By leading the industry in design and innovation, Tridan provides the best solutions for coil manufactures. One of the advantages of our Flaxpander machines is the semi-portable design. YOu can move the machine to where you need it in the shop. The Flexpander – FE can expand two tubes per cycle and handle any work load. The balanced FE allows for you to rotate it to what angle you need it allowing for diagonal, horizontal or vertical expanding. While the FE and the FE-5 both can handle good volumes of work, the Quadpander is ideal for large volume of work. The Quadpander QE was created for larger commercial or industrial producers. In addition, the QE can handle almost three times that of the FE or FE-5. Also, this helps provide manufacturers with lower cost and more efficiency in producing coils. Another great benefit of the QE is no limitations on the coil length being expanded. In addition, you will have excellent control of the coil dimensions. While the Quadpander is a great machine, we do offer other coil expansion machines as well. The Super Flexpander – SFE and the Super Flexpander – SFE-4W are also available. The SFE is designed for specialized needs. This Flexpander is designed to expand large diameter coils, unique materials, and thicker wall coils. Both of these Super Flexpanders are currently available at Tridan International. Finally, we strive to provide the best machinery for the industry. Our innovative machines and reliability set us apart from the other companies. Give us a call today at 217-443-3592 or fill out one of quote forms for a quote on Tridan machines today! Tube expanding is the process of reducing a tube wall. By simply expanding the diameter of a tube, you avoid having to purchase all new tubing. Tube expansion has been an important process for a multitude of industries. As many of you already know, there are a variety of tube expansion machinery within the industry. At Tridan International, we have an extensive line of tube expansion machinery that are available in different forms. Also, these options include horizontal expansion, vertical expansion, and semi-portable expanders. Serving in the Texas and Oklahoma area, we offer coil expansion solutions from small coil to large coil. This type of machinery can expand and add the final belling to a tube at the same time. The horizontal tube expansion uses no hydraulics and over time, it has changed its coil sizes very little. The vertical tube expansion machines are created with saving space in mind. These double sided machines are capable of doing two different jobs at one time to cut down on time. Believe it or not, because of this process, it’s able to save up to 22% in head room. Semi-portable expanders are versatile portable systems that are designed to be much more mobile than the larger counterparts. 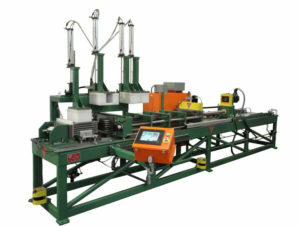 In addition, this kind of machinery is able to produce a large amount of volume and are ideal for smaller shops. Tridan International has been dedicated to providing coil tube expansions since 1966. Also, we strive to be an industry leader and are well known for building and designing machines that operate to our customer’s satisfaction. Administering quality machines to the Southwest, especially Texas and Oklahoma, Tridan maintains a reliable flow of accurately produced parts. Finally, if you are interested in learning more about tube expansion, please feel free to contact us today.